Minecraft is one of the most popular and independent or first-person game. It has millions of users worldwide which give it beyond belief support from 2009 since it launched for PC users to try out. However, now it launched for mobile platforms like Android and iOS. You can enjoy playing multiplayer with Minecraft, for that you need a Minecraft server. Also, curiosity makes Minecraft users do something strange with it. Queries like how to DDoS a Minecraft server remains always in trend. For doing that, reasons can be multiple, or whatever the case is, here we are giving you a two ways to DDoS a Minecraft server, one by using a tool and other by manual way or using command prompt. 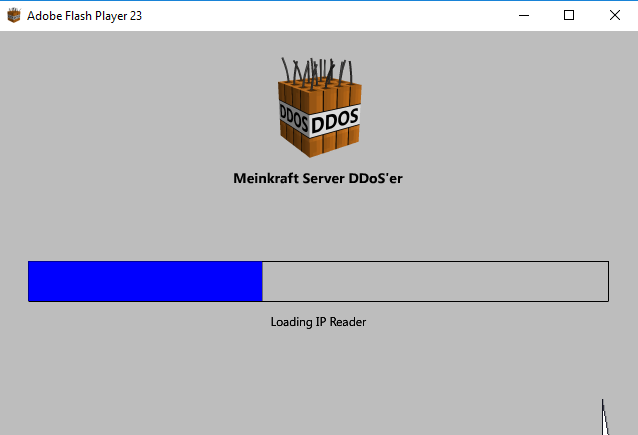 There are various tools which can work for you if you wanna DDoS a website but for Minecraft here is a tool we which is specialized for DDosing Minecraft server. and here is how to do with that tool. The tool is known as Minekraft Server DDoSer, which you can download from here. Download and Run the tool on your windows system. Here you don’t have to go through an installation process to run this tool. Once you download this tool, you can open the downloaded exe file and it will load and open the minekraft DDoSer automatically. Now you need to get the IP address or the URL or Minecraft server, basically using Minecraft server alphabetic format is much better at remembering than an IP address. Simply put the IP address in the whatever format you have. Now you need to set the power of your attack Or the Attack intensity, for that go under DDoS attack Intensity area and set/adjust the bar to Higher. Also, add the message you wanna to show while DDoSing the Minecraft server, so go under Attack Settings and put the message in the box. Putting the message is optional so it will not affect the DDoS process anyhow. Under Methos area, keep the method same as default which is SYN Flood. Once done with all above steps, means you are ready to go and hit that button to attack the Minecraft server. For that, just go to DESTROY section and hit the Start button. You will see the status changing under the Status section which is Idle by default. 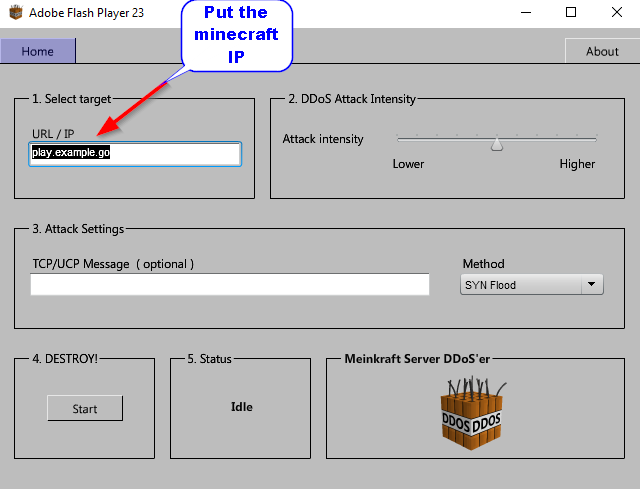 You can also perform this task of ddosing a Minecraft server using other tools like LOIC which is very simple and easy to use tool and you can also use that by watching one of our articles on how to DDoS. Similarly, you can ddos a minecraft server with cmd. For doing that with command prompt you need to have the Minecraft server IP, it can be numeric or alphabetic, both will work. Once you have that, just follow the below steps to know how to ddos a minecraft server with cmd. Open the command prompt, by simply searching or going through the manual way to find that. This will send the 5500 bytes of data with each execution. And to make the attack more powerful you can do the same on multiple systems instead of doing this on a single system. It will prevent and keep your system safe from hanging or lagging between process.